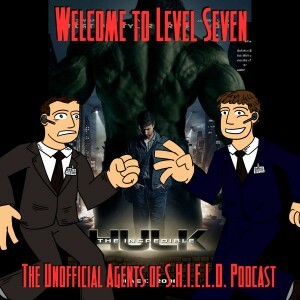 Our fourth episode brings us to THE INCREDIBLE HULK, the movie that features the Hulk, reinvents the Hulk, and is the first post-Iron Man Marvel movie. Also, after the episode is over there is a post credits mini-review of Man of Steel. Sure it's DC, but this is the beginning of DC trying to copy the success of The Avengers. Interestingly, INCREDIBLE HULK and MAN OF STEEL may have more in common than you might think. There’s a lot of social buzz around this show. Hope it doesn’t flop! It’s been a while since I saw this movie but one thing I do remember was seeing the leader’s origins in this movie and thought it was such a great idea of having the “next villains” origin told in this movie so if they did the Incredible Hulk 2 we wouldn’t have to spend the first 30 minutes of setting up the villain. I wish more super hero movies would do that. Yes, origin stories are necessary evils — so getting one out of the way while actually incorporating it into the plot of one movie, so it can just jump into the second movie is a good thing. Regarding JLA, what if the story revolved around a single (possibly new) superhero? Doing a lead-in like Hellboys. Don’t explain every origin in detail, just give them the facts of what they can do. I think it was mentioned elsewhere, but have the other JLA members being more mentor like as our window in to the world gets up to speed handling the challenge at hand. I just don’t think they can do a lot of origin movies like Marvel has done. DC’s cast is very dynamic. I really think they need to set the tone of a single movie and then tailor the JLA to fit that tone. And if they aren’t the primary focus.. there’s a lot of blurring a writer and director could do to make it work. I just have real doubts about putting Superman and Batman in a single movie and keeping either the focal point. Even Wonder Woman and Green Lantern could be a lot to bite off. They just can’t make a DC version of the Avengers. I can’t see it working very well. Avengers surpassed my expectations in doing so. That IS its identity. I think if JLA tried to mimic that, that’s exactly what it’d come across as.